I started this blog wanting it to be a journal of every bit of my experience in the outdoors be it mtbiking or running. However, as it has always been my passion to write and to talk about all of my other interests, experiences and encounters, I have thought of making this blog as a journal of what the world gives me to take and to share beyond running and mtbiking. Welcome to my new world! Open a savings account with just Php50 with Cebuana Lhuillier’s Micro Savings product! The newest addition to the reigning MVP’s signature collection is powered by breakthrough technology and infused with game-changing design. If you are a fan of the Under Armour Curry series, check this out! Stephen Curry returns to the court this season with a renewed drive, hunger and focus on the future. Fuelled by Stephen’s unwavering will to always take his game to the next level, Under Armour will drive the game of basketball forward with the latest addition to Stephen’s signature footwear collection, the Curry 3. Constructed with proprietary technologies and designed to drive the league’s back-to-back MVP to new heights, the Curry 3 is the optimal combination of lightweight support, balance, speed and durability. Powered by Under Armour’s newest breakthrough in fabric technology, Threadborne™, Under Armour and Stephen have created a new shoe that breaks the mould of what to expect from basketball footwear, with innovative technology and design. • Threadborne™ is a new technology created by Under Armour’s innovators after examining a parachute, specifically paracord – a strong piece of material that is at the equipment’s core. Within the weave construction of paracord, Under Armour discovered ultra-durable yarns and rebuilt them into a fabric engineered to withstand the rigors of an 82 game season and support the two-time MVP as he transcends the limits of the game. The Curry 3 Threadborne fabric is comprised of braided thread that wraps around a larger, corded panel, delivering unparalleled lightweight directional strength and infinite support. • Meta-Wing lines the heel of the Curry 3 to expressly support the subtalor joint – the joint that connects the ankle and heel bones, and is crucial in terrain balance, pivoting and shock absorption. The shoes create a snug fit that is unrivalled in stabilizing the foot, ensuring the most complete and efficient way to cut and move laterally on the basketball court. • Anafoam is constructed on the medial to deliver body-mapped fit, lightweight structure and support. • Charged Cushioning™ is a unique foam technology, which absorbs impact and converts it into a responsive burst, making each stride or change of direction explosive. • Herringbone Traction: The return of Herringbone traction on the sole of the Curry 3 amplifies stability, grip and support on the court. The Curry 3 mid style retails for PHP8,995.00 and is now available in all Under Armour Brand Houses, selected retail partners, and on http://www.underarmour.com.ph with the “Dub Nation Heritage” and the “SC Camo” colourways. Curry 3 was launched at the PBA Draft Combine last October 27, at the Hoops Center Shaw Blvd. and was awarded to the MVP of this season. For more information, follow @UABasketball and @underarmourph on Twitter, Instagram and Facebook. 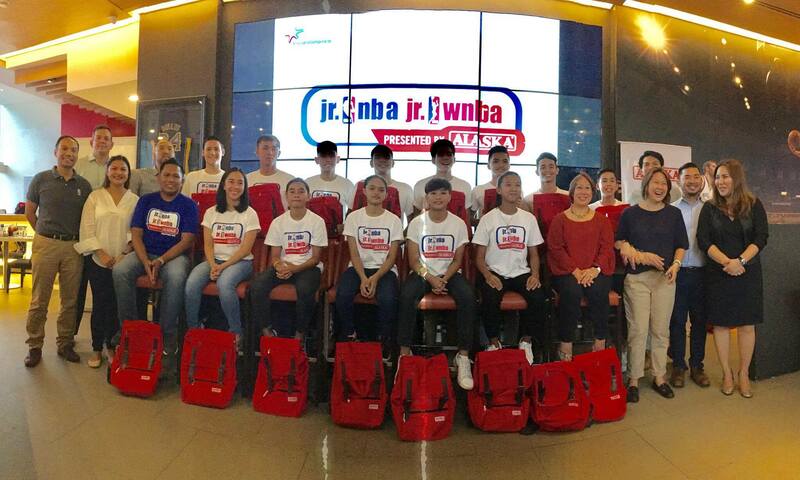 The best boys and girls basketball players from Cebu, Baguio and Bacolod overcame the odds to make the final lineup of the JrNBA/JrWNBA Presented by Alaska All-Star teams that will fly on October 6 to Shanghai, China to participate in a once-in-a-lifetime NBA experience. Boys and girls from the provinces – especially those from Bacolod, Cebu and Baguio – did surprisingly well when ranged beside their counterparts from Manila. Cebu City public school students Darliene Ragasajo (14 years old) and Florence Jil Talas (14) led the JrNBA/JrWNBA Female All-Stars. Tracy Carl Dadang (14), Fritz Felix Valencia (14) and Harold Alarcon (14) – who were selected in the Cebu Regional Selection Camp – led the members of the Male All-Stars. Valencia travelled all the way from Bacolod City, while Alarcon came from Silay City, Negros Occidental to qualify in the Cebu Regional Selection Camp. Riz Ozner Gatus (14) of San Fabian, Pangasinan from the Baguio Regional Selection Camp, also advanced to the Male All-Stars. The players were selected in a nationwide search through Regional Selection Camps in Baguio, Cebu, Bacolod, Davao and Makati. The final 10 boys and five girls were named members of the Philippine All-Stars during the National Training Camp at the SM Mall of Asia Arena. The JrNBA/JrWNBA Davao Regional Selection Camp was also well-represented with 13-year-old Rozie Amatong of Davao City and 14-year-old Aloha Marie Betanio of Malaybalay City, Bukidnon – who travelled all the way to the Davao Regional Selection Camp – making it to the Female All-Stars. Additionally, Elegino Chollo of Davao City was named Coach of the Year Male. The fifth member of the Female All-Stars is Ma. Cecilia Quilenderino (14) of Dalig National High School, Antipolo City. The other members of the Male All-Stars are Julian Alfonso and Isaiah Miguel Blanco (Alaska Powercamp), Andrei Philip Lechoncito, Jearico Nuñez, Miguel Rey Luis Tan and and Kai Zachary Sotto (Manila Regional Selection Camp). Arayi Ewon was named Coach of the Year Female. They will join 90 other boys and girls from JrNBA Programs in Indonesia, Malaysia, Singapore, Thailand and Vietnam to watch the NBA Global Games China 2016 between the Houston Rockets and the New Orleans Pelicans at the Mercedes-Benz Arena. JrNBA/JrWNBA Presented by Alaska promotes the importance of regular physical activity, trains participants in the fundamentals of basketball and teaches the importance of core values, including sportsmanship, teamwork, a positive attitude and respect. The JrNBA Program is presented by Royal Friesland Campina in the Philippines, Indonesia, Malaysia, Thailand and Vietnam through its Alaska Milk, Frisian Flag, Dutch Lady and Foremost brands and conducted in Singapore through partnership with Sport Singapore. This program has touched the lives of more than 1.5 million children, parents and coaches across Southeast Asia by conducting camps, clinics, and NBA Cares community outreach activities. For more information visit Alaska Milk’s sports channel http://www.playph.com and like @PlayPH in Facebook and Instagram for inspiring stories on Filipino sports fans of all ages and skill levels. Fans can also visit the official website at http://www.jrnba.asia for more information on the JrNBA programs. “Friend” the NBA’s official account on LINE by adding @nba_global. Follow the NBA on Facebook at http://www.facebook.com/nba and Twitter at @NBA for all the latest news and updates. For all things NBA, visit http://www.nba.com. It’s On – #RunWithFight at the UA Run Crew! The running community is abuzz with a lot of activities and programs that are meant to help runner sustain and progress into their sport. There are even some which have programs meant to entice non-active people to get up and start running! As somebody who is trying to get back my running groove, the fact that excites me most is not just the number of options I can look into and choose from but also the quality of options available! It is just amazing. One of the latest to join the fray is Under Armour who just last Saturday, October 1 officially launched it’s running program – the UA Run Crew. Created in partnership with celebrity fitness couple Coach Toni and Jim Saret’s APEX High Performance Training Camp, the UA Run Crew is a running program that is tailor-made for active lifestyle enthusiasts and aspiring runners. It banks on the well-accepted and widely known scientific program by the APEX team of Coach Toni and Jim and it provides a step-by-step guide towards a person’s objective in running. The UA-APEX Run Crew kick-off last Sunday at the BHS Amphitheater attracted more than 200 runners – from beginners to elite, for a few hours of intensive training to enhance their strength and endurance in running. Leading the activity which was open for free to the public was program directors, Coaches Jim and Toni Saret. They were also joined by Under Armour Affiliate Trainer Kat Garcia and as a special guest, Brand Ambassador Piolo Pascual. Piolo, a known fitness enthusiast who consistently trains and joins the Ironman 70.3 race in Cebu (in a relay team where he does the bike leg), shared how gearing up with a high performance apparel and shoes like Under Armour will help one perform better and perform more. He also stayed to join everyone for the initial session which was Coach Toni’s intense 4-minute workout. The UA-Apex Run Crew program will be made up of 24 sessions and will run until December 3, 2016 and will have as its culminating activity, the Under Armour Marathon race. Sign-up now to be part of the UA-Apex Run Crew! Registration is available in-store at Under Armour Brand Houses in Trinoma and UP Town Center and online at http://www.coachjimsaret.ph. For more info, visit www.coachjimsaret.ph. Now on its 100th year as a company, it seems like Mizuno is bent on making its presence felt in the running community through a series of valuable contributions. After releasing the latest versions of the Wave Rider (19) and Wave Inspire (12), they have recently released a new version in their Wave Creation line, the Wave Creation 18. These new releases only validates the fact that Mizuno’s notable contribution to the running community has always been the development of high-quality products that function well with exactly what serious runner needs. Unboxing the shoes, I shall give credit to Mizuno for consistently coming up with exciting color combinations. Mine was in bold colors of diva pink, black and yellow. I am not much into pink and would have preferred the other color way of capri, diva pink and blue but the pair I got elicited glances everytime I wear it and will definitely be a favorite for women runners who are on a lookout for eye candy colors on a shoe. At first fit, I felt outright comfortable with the pair. It has a mesh upper that is breathable. It was occasionally drizzling when we had a test run and my feet did not get wet. Hopefully this will still ring true for running in the rain. The shoe, maybe because it is designed for large runners, is not as narrow as the other Mizuno shoe line. From the toe box, the midsection and up to the heel counter, the shoe is a bit wide for me who has narrow feet. But not to worry as all I had to do is make sure that I pull the shoe laces tight enough for a comfortable and snug feel. For those who have narrow feet like me, I suggest that you try one in your actual feet size as this might provide the perfect fit for you. The cushioning is firm and can be felt especially on the heel area. Overall we had a nice short test run, enough for us to get an initial feel of the shoe. It is a shoe that will work for me on short runs and I look forward to being able to try it on long runs and on different surfaces like on wet roads, on the track and on light trails as the Wave Creation 18 is said to be designed to be enjoyed while running anywhere. The Mizuno Wave Creation 18 is now available in Mizuno Stores in the Philippines. *Thank you to the people of Mizuno Philippines for inviting me to the Wave Creation 18 test run and for providing me with a complimentary pair. What’s new with Nike Running? Well there’s a couple of exciting gears that you may want to check out and indulge on. First, Nike came out with a new version of it’s famous Nike Zoom Structure line, the Nike Zoom Structure 20 which compiles insights from past styles to introduce the line’s most-advanced design to date. Then there’s it’s newest innovation, the Nike Hyperadapt 1.0, an “auto-lacing” shoe using the “adaptive lacing” system, that is set to be available in retail this November 2016. To know more about these two lines, check out the official pressers and photos below. Welcome the Nike HyperAdapt 1.0, the first performance vehicle for Nike’s latest platform breakthrough, adaptive lacing. The shoe translates deep research in digital, electrical and mechanical engineering into a product designed for movement. It challenges traditional understanding of fit, proposing an ultimate solution to individual idiosyncrasies in lacing and tension preference. For Hatfield, the innovation solves another enduring athlete-equipment quandary: the ability to make swift micro-adjustments. Undue pressure caused by tight tying and slippage resulting from loose laces are now relics of the past. Precise, consistent, personalized lockdown can now be manually adjusted on the fly. “That’s an important step, because feet undergo an incredible amount of stress during competition,” he says. Beers began pondering the mechanics shortly after meeting Hatfield, who dreamed of making adaptive lacing a reality. He asked if she wanted to figure it out — not a replication of a preexisting idea but as “the first baby step to get to a more sophisticated place.” The project caught the attention of a third collaborator, NIKE, Inc. President & CEO Mark Parker, who helped guide the design. The process saw Beers brainstorming with a group of engineers intent on testing her theories. They first came up with a snowboard boot featuring an external generator. While far from the ideal, it was the first of a series of strides toward Beers and Hatfield’s original goal: to embed the technical components into such a small space that the design moves with the body and absorbs the same force the athlete is facing. Through 2013, Hatfield and Beers spearheaded a number of new systems, a pool of prototypes and several trials, arriving at an underfoot-lacing mechanism. In April 2015, Beers was tasked with making a self-lacing Nike Mag to celebrate the icon’s true fictional release date of October 21. The final product quietly debuted Nike’s new adaptive technology. Shortly after, the completion of the more technical, sport version they’d originally conceived, the Nike HyperAdapt 1.0, confirmed the strength of the apparatus. In short, the Nike HyperAdapt 1.0 is the first step into the future of adaptive performance. It’s currently manual (i.e., athlete controlled) but it makes feasible the once-fantastic concept of an automated, nearly symbiotic relationship between the foot and shoe. The first generation of the HyperAdapt 1.0 will be available in the U.S. at select Nike retail locations. Appointments to experience and purchase the product begin November 28. Details on how to make an appointment will be announced in the coming weeks. As the United States running boom (initiated in the ’70s) advanced, athletes’ footwear needs evolved and diversified. These realities paired with a greater understanding of over-pronation (the foot rolling inward upon ground strike) led Nike to answer a call for a running shoe with greater stability. The Nike Air Structure, Nike’s most stable silhouette, debuted in 1991. 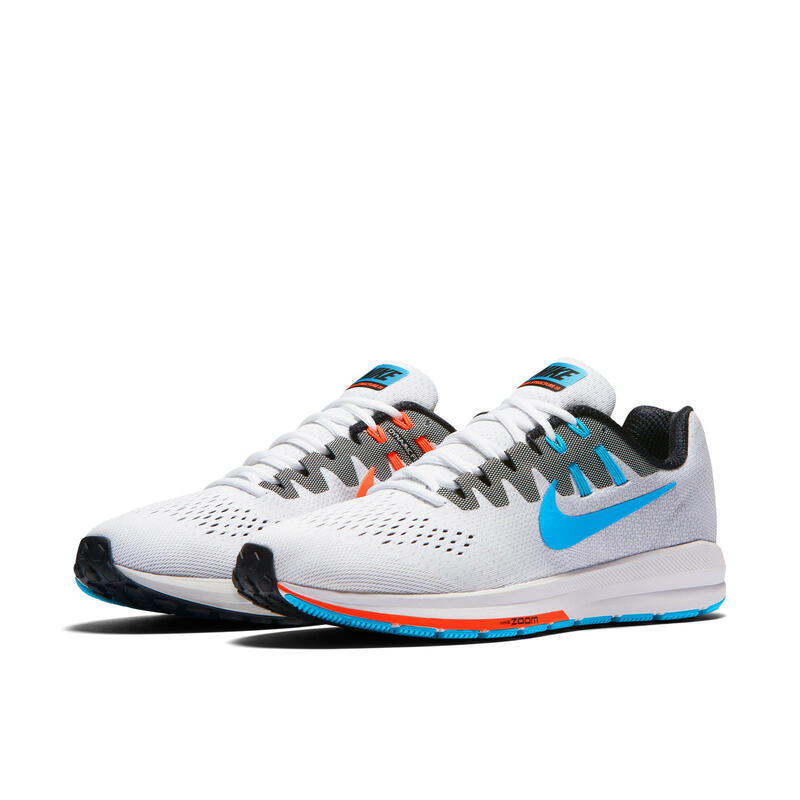 The Nike Air Zoom Structure 20 arrived for men and women last September 29 at Nike.com and on retail stores at PHP 6,295 SRP.